Nobel’s initial growth didn’t occur as planned but, after acquiring six properties in 2014 and announcing two more so far this year, things are back on track for the Quebec-based real estate investment trust. Nobel (NEL.UN-X) incorrectly forecast it would have $150 million in assets within 15 months when it launched in November 2012 (Property Biz Canada, November 13, 2012). “The capital markets for junior REITS and small caps have been pretty tough over the last two or three years,” said Teasdale, who conceded Nobel essentially started from scratch again last year — this time with a $10-million private placement from RFA Capital. Nobel announced last month it was proceeding with a brokered private placement valued at approximately $12 million, with Dundee Securities Ltd. as lead agent, and Teasdale said the marketplace seems much more receptive now than in the REIT’s early days. Nobel went from owning 72,734 square feet of leasable space spread over two investment properties on Dec. 31, 2013 to eight properties totaling 395,970 square feet of leasable area and valued at $59.6 million one year later. Mortgage debt ratio dropped from 64.3 to 58.8 per cent during that same period. 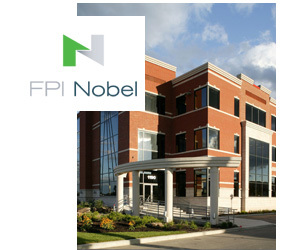 That strategy ensures Nobel isn’t spending time and money on day-to-day problems and has more flexibility to concentrate on long-term asset management. Teasdale said 98.5 per cent of Nobel’s available space is leased and the quality of its tenants is exceptional. Teasdale said Nobel has good relationships with its lenders — which include MCAP, Royal Bank of Canada and Desjardins Group — and looks to leverage mortgage financing for properties at a rate between 60 and 65 per cent. There’s demand for small industrial and office space in Montreal’s suburbs, where operating costs for companies are cheaper, which plays into Nobel’s investment strategy. Teasdale concluded he was generally satisfied with the state of the Quebec commercial real estate market, while also revealing he’s a baseball fan.